A little weekend trip and a nice Saturday brunch. What more could you want? A cold beer maybe, but this is already a good start. Pardon for the blurry pics by the way, I only had my old iPhone to shoot these with and no editing software. I finally got my grey wool cashmere blend patch pocket jacket from my tailor from a complete facelift. The shoulders got narrowed, waist taken in very little and sleeves shortened and taken in. The tie is from Holliday & Brown, but in reality it's an E. Marinella. Love the feel of it, and the warm burnt red is perfect for the season. The flowers on it are olive and light blue. 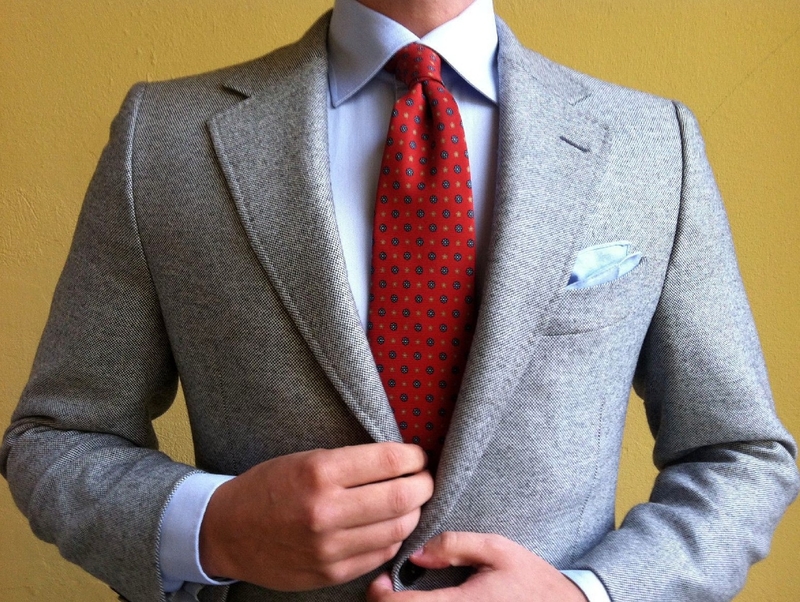 Pocket square is a plain light blue cotton square. The trousers are my PRL navy cords. Someone asked me the color some days ago, and it's "Preppy Navy". Don't ask me from which year they are from, you never know for how long these eBay finds have been collecting dust in someone's closet. The belt is from Equus Leather, bridle leather in the color they call Australian Nut. Boots are Loake Litchfields, and while I like the color, not sure I'm that fond of the shape after using them a few times. Tomorrow a nice and more of a late summer combo I had on last weekend. I've never actually been a fan of corduroy, but theese look nice.Probabily only because I never looked at them when I was in higher-end stores, only seen some H&M and Zara ones.Next time I'm at the Polo RL outlet I will look for a pair to examine up close. The jacket also is lovely, I really like the patch pockets on it. But I don't know if I shouldn't save up to get the C&J Tetbury instead. 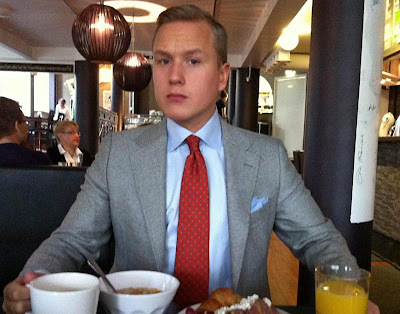 Btw, can't wait for the suitsupply stuff to arrive, I'm so nervous! I personally like all things preppy when the weather starts cooling down. Also all a bit rougher street style elements work well during fall and winter in my eyes, and I tend to implement those in the more casual days. Corduroy is a part of that Ivy spirit for me, so I like it a lot. 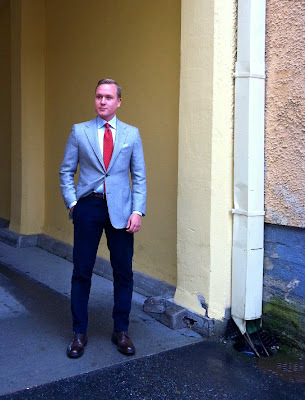 I think when tailored right and in right color, it's fantastic in colder climate. But thanks, and I like the jacket too, and now it fits beautifully, so I'm quite happy with it. I think it also depends where you live - I couldn't see myself wearing cords much in, say, Spain or Italy. In Finland I think they're as much home as in an Ivy campus in the States. I think the boots look a tad too big (ugly). That's the problem with the Litchfields (and generally with all cheaper brand boots), they are somehow a bit boxy and not as pretty as they could be. My Tricker's Stows are somehow a lot more elegant while still retaining that cool ruggedness that you want from a heavy brogue boot. 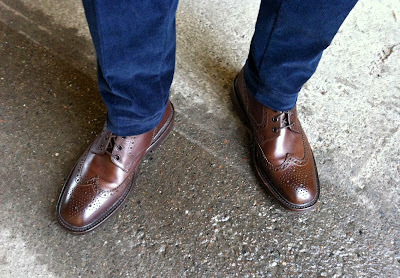 Think I might sell these and just give up and spend a bit more to get a pair of espresso longwing boots from Tricker's. Pimlicos aren't very elegant to be fair. They suffer from the same clunkiness as many other Chukkas. I'd just save up to get Tetburies, as at least in my eyes chukkas need to be sleek and elegant. If you think alike to me, I'm sure you'd be much happier with the C&Js. Anyway, nice talking to you again. I'll post better pics of my new SS jacket tomorrow, so check back soon. I used to love preppy stuff too when I was in college, it was my main inspiration when I overhauled my wardrobe back then and got rid of the t-shits, hoodies and sneakers.But somehow corduroy never found it's way in my wardrobe. I actually envy you for living in a colder climate, which allows you to start layering in early fall and experiment with heavier cloths. I live in Romania, in the western part of the country, where the climate is similar to northern Italy, so it's hot.Even now there are 30degrees at noon. But, as my girlfriend is studying in Geneva, I spend a lot of time there too and I absolutely love the weather as it is much cooler and allows me to express my style better. About shoes, I just wish english shoes were available in more stores. It would be nice to see, try on and compare them in person. Even in Geneva, a city full of luxury retailers the selection is scarse. To me corduroy is one of those fall and winter textures that already make you a bit warmer, but I have to admit I've only found it just a few years ago myself. Yeah, there aren't too many places in the world where you can find good quality shoes in many stores. In Finland the situation isn't too good either (getting gradually better though). Also, trust me, there is nothing to envy in the Finnish climate, cold just isn't for humans. Anyway, no problem, it's always nice to get some thoughts and comments for what you post. Have a nice upcoming week and enjoy the rest of that 30 degrees you still have.